NOW is the time to be buying a property in Rockhampton according to Belinda Wonson who says house prices are "unreal at the moment". Ms Wonson is one of the many savvy purchasers who has taken advantage of Rockhampton's buyer friendly market, where vendors have competitively priced their properties to meet the market. 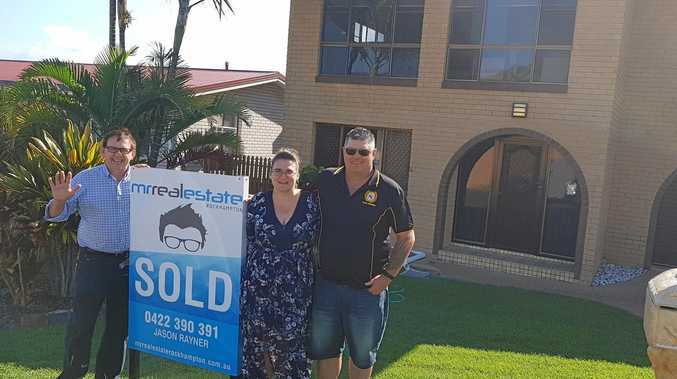 Keen to relocate from Moranbah with her fiancée David Thorburn and three children to be closer to her extended family, she has kept a keen eye on the Rockhampton's property market for the past six months. "We got our house at a really good time, our house was a bargain," Ms Wonson said. "It happened very fast. We'd been looking at houses in Rockhampton since the end of May. "We come down to Rocky once a month and every Saturday we'd trek around to all the open houses and we did notice the property prices significantly decreased during that time." She said her prerequisite was to find a property with four to five bedrooms with a swimming pool and she was seeing those sorts properties advertised for $400000-450000. It was a chance perusal of her spam email folder in September that revealed the critical email from Mr Real Estate's principal Jason Raynor. Ms Wonson's attention was seized by a two story brick property, perched on a breezy Frenchville hill, featuring five bedrooms, office, rumpus room, two car garage and a swimming pool, seeking offers above $359000. Within 10 minutes of inspecting the house they were "in love" and by the end of the day, they had it under contract. After 12 years living in Moranbah and working in the mining industry with her partner, Ms Wonson was excited to be closer to civilisation. "I love Frenchville as a suburb, I love all the restaurants along the river-front, Stockland has everything there you need and you've got Bunnings," she said. "The other bonus for us was the day care availability is phenomenal, we literally secured a position just around the corner. "I've been very vocal my praise for Rocky and how great it is, just the facilities we have available." Mr Raynor said he was starting to see those mums and dads property buyers "coming out of the woodwork", often to help their children buy properties. "We're starting to feel the early run of people realising 'hey, there's something happening in Rocky', there's a bit of confidence back, there's a whole lot of good news filtering through and the market is starting to take a bit of shape," Mr Raynor said. "There's probably 80-100 sales per month happening and we believe that's basically happening because people are starting to feel more confident that the market is starting to grow."